Royal Domesticity by Denise Rayala: Blissful blogging, is there such a thing? Yes, there is. Allow me to tell you a story. Last week, in the middle of the night, my 44th AML sent me a private message on Facebook, asking for advice. Wow. I don't think I'm in any authority to do so but it flattered me. It has something to do with blogging. She asked me what motivates me to blog, what do I do when I don't feel like blogging, something about bashers, when I think that my posts are better left in the drafts folder or when I just feel like giving up. I felt heavy. You see, I kinda felt some of her 'questions' a little over the past month. But... she made it light when she said that she feels at home when she reads this blog, that this humble palace is not, as how she puts it, "pa high profile". OK, you might say I'm making up stories. Email me for the screen cap. Hehe. So what did I tell her? First, I'm not a high-profile social lass so there's no need to make my posts sound as if my lifestyle's about glitz, glamour and ootds. I am a kickass stay-at-home army wife and mom who never lets her husband leave home hungry and horny. Haha! And then I asked Ghezzi if I can publish our conversation here so to at least impart the blogging tips, which are basically 'answers' to her questions, with you. My answers were short, straight to the point but sweet. For this blog, I thought of adding more yadada to support it. To be honest, none. When I started this blog, I just wanted to write. I didn't aim for anything. Then, I virtually met some blogging moms, I wanted to be like them. I joined and hosted giveaways, attended events, and hoped that one day I will be a celebrity blogger. This babe can dream! But well, the aspiration to become a somebody made me lose the real intention in the first place, to write. Don't worry, I'm back to being my old self again. And to answer her question, I just said I love telling stories! Perhaps, my being "kulang sa pansin" makes me an effective cyber storyteller. Don't you think? To hell with people hiding behind anonymous usernames! I used to join these trolls in their games. I used to answer back. I used to get affected. I allowed them to manipulate my emotions. I allowed them to bully me. I allowed them to enter my cyber kingdom. What exactly happened to me and to them? I was miserable and they were happy. It's the bashers' happiness if we let them rule our blogging life. So my advice — IGNORE. It's for the best. I never run out of ideas, bragging aside. I have a truck full of stories caged in my brain; brain farts, yes. One idea will be linked to another and another and another that it got to be a thousand... and then, bomb! No more ideas at all. Hahaha! Really, that happened to me. What I realized was (again, ideas) I have to focus on one idea at a time. Don't be too excited to share so you won't over-share. Like thesis writing (sorry about this, I was our group's writer/editor then), start with a general thought (objective) then followed with specific thoughts (objectives). Specific thoughts must be correlated to each other and to the general thought. It's hard to follow this, especially if you have a personal blog like mine. But it won't hurt to do task-y (not a real word, I believe haha) things like this. Give it a try and you will come up with better posts. Oh, and one more thing, give yourself a deadline. I'm sure "Ms. Cramming Martin" will give you ideas. There you are, the five things that paved way for me to blog blissfully. Speaking of bliss, I'm so happy for my dear friend Martine, who finally launched her new cyber baby, Make it Blissful. It's basically the former Dainty Mom, but with bigger and bolder intentions to help us, in her words, aspire to live meaningfully. One of her ways to do just that is through her workshops. She'll be having one on February 1st. For more information and to register, click here. 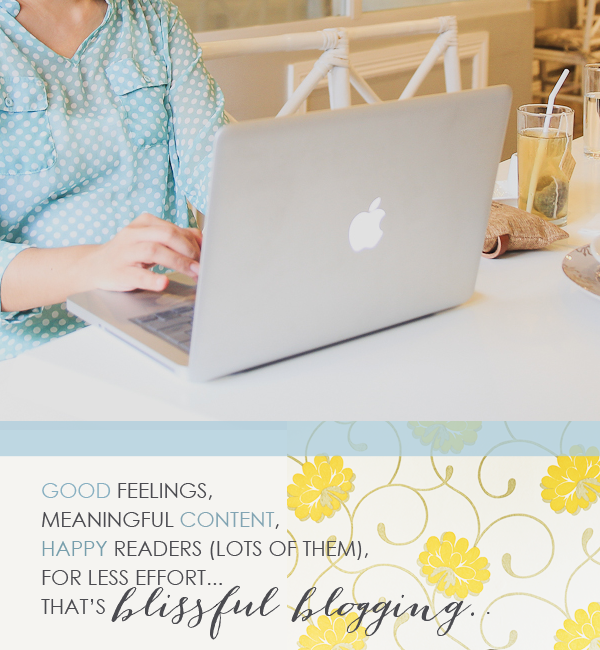 about blogging or life, in particular? Hmm.. I really wanted to attend these self-help/self-improvement workshops kaso ang mahal lang chaka hirap iwan si baby. But maybe I'll try it one day if I'm ready to attend. 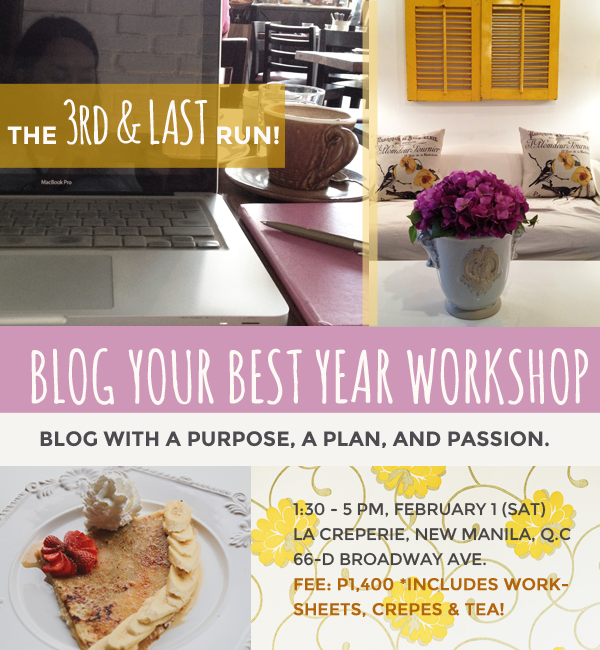 very helpful yung mga tips na ito denise tulad sa mga bagong blogger like me. I wanted din sana to attend mga activities for moms kaso hirap gawin pag maliit pa ang baby. Me naman, i am not a good writer, tama ka write kapag gusto mo. Hirap naman sumulat sa blog ng walang maisip or napipilitan lang diba? I'm enjoying blogging din kasi nakakausap din ibang mommies and ask for opinions about baby stuff.